Newton BoCo AT II Reviewed - To Buy or Not in Apr 2019? The Newton BoCo AT II was designed in and inspired by the mountains of Colorado. These are shoes for the adventure runner who is looking for a brave companion that will take them on the most torturous of terrains. The big difference in the BoCo AT II from the original is in the upper. The new upper features a water-repellent closed mesh that provides breathability and protection to the runner. However, with this more protected and durable upper, runners can also expect the shoe to feel slightly heavier than its original version. Overall, this shoe provides superior traction to the runner and protects against anything one might encounter on the trail. This is a shoe that is chock full of innovative technological design elements from the upper to the outsole. Runners loved the bright style and reflective material used on the shoe but commented that they wished the shoe was offered in more color combinations. This shoe is slightly higher in price than other trail shoes on the market today, but runners noted that the durability made the shoe work the price tag. Read on to see if the Newton BoCo AT II is for you! Any trail runner knows that a good trail shoe cannot exist without a good outsole. Newton clearly knows this too because when they designed the outsole of this shoe they place durability and protection as the top priority. Newton utilized their unique traction design which uses the lug system to grip the ground below and provide superior feedback and control to the runner. Newton calls this their Action/Reaction technology. It provides a springy, protective grip to the runner and protects that regardless of the conditions of the trail. The lug design is multidirectional and ensures that runners can adventure on uneven and slippery terrain and still feel safe and secure. The midsole of this shoe features some impressive technology. Most notably, Newton uses a metatarsal sensor plate that is biochemically engineered to provide superior responsiveness. The foam used in this shoe is a full length EVA midsole foam that is also provides responsive cushioning and provides added support to the runner. Runners loved the combination of flexibility and cushioning in the midsole that helped them feel protected but also maintained a feeling for responsiveness and a closeness to the trail below them. Newton also includes their patented ETC sock liner. This sock liner is designed to wick away sweat from the foot and give the shoe an anti-bacterial element that reduces sweat and odor. It is also engineered specifically to reduce friction which can lead to painful blisters and hot spots. Runners can expect to see the key differences to the second version of the BoCo AT in the upper. Primary, the upper has been redesigned with a water-resistant design that also still manages to provide the runner with breathable, moisture-wicking features. This upper is made using a closed mesh which allows for moisture and heat to escape but keeps the foot safe from the dangerous debris and various elements of the trail. This shoe also features a protective tongue that is attached to the upper in a seamless construction that prevents anything from entering the shoe and hurting the foot. Newton did a great job of including small details like the reflective heel and the rubber toe bumper around the toe box to ensure that the runner is safe and secure on their trail running adventures. The Newton BoCo AT II is able to do something that not many other trail running shoes are able to do well. It is able to combine protection and durability with breathability. The upper of the shoe is designed using closed mesh which enables moisture and heat to escape to keep the foot cool and dry, but it also protects against debris on the trail. Runners commented that this breathable upper kept them from developing hot spots and blisters during their runs. 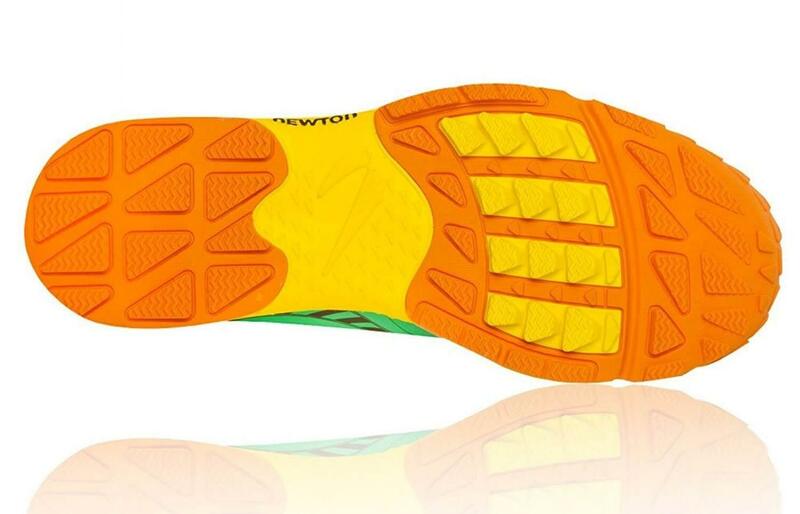 Newton traded a few extra ounces for a water-resistant upper and an outsole that is lined with aggressive, multi-directional lugs. At 9.9 ounces, this is not a lightweight trail running shoe, but it also is not the heaviest, most cushioned shoe on the market either. It still provides a flexible, natural feeling ride. Runners loved the comfort provided by this shoe. The midsole foam features a traditional EVA foam that is cushioned by also springy. Runners commented on the responsiveness and bounce of the shoe. They appreciated that the shoe moves with their natural movement and allows them to feel connected to the trail. Runners also found the upper to be very breathable, and regardless of the weather outside, their foot stayed cool and dry. The water resistant closed upper made this a safe shoe for running in the rain or in wet conditions. 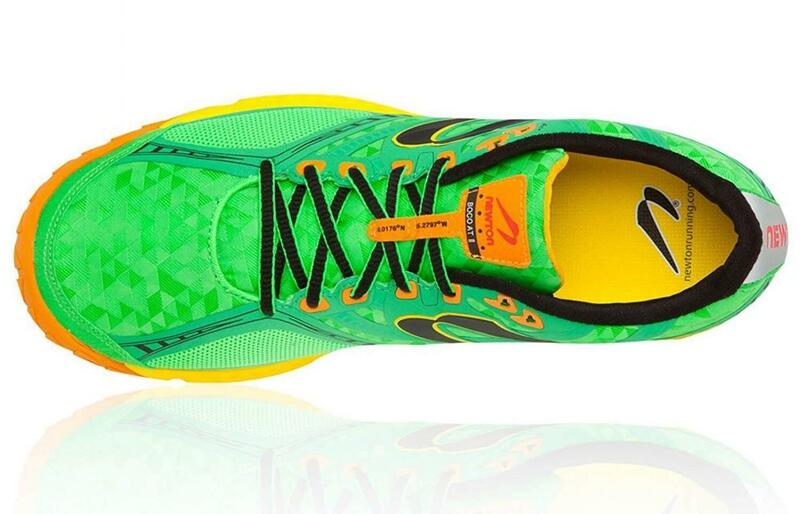 Runners loved the brightly colored, green and yellow design of the shoe. However, they did comment that they wished the shoe came in a wider variety of colors. This is certainly a shoe designed for athletics and runners commented that it wasn’t the right shoe to wear as part of your casual outfits. Runners did like this shoe helped their feet look sleek and slim and didn’t add any extra bulk to their feet. This shoe features a wide variety of protective elements. Starting in the upper, runners will find a water-resistant, closed mesh design that protects the runner against the debris of the trail. The single layer upper and the connected tongue unit keep the shoe from allowing harmful or annoying debris to enter the shoe and distract the runner. The upper also comes with reflective elements in the heel to protect the runner while they run in low visibility conditions and the toe box of the shoe is lined with a protective rubber toe bumper that protects the runner from roots and rocks that may get in the way of their run. Additionally, the outsole is designed with an aggressive, multi-directional lug system that ensures maximum grip on the toughest of terrains. Runners said that this shoe lasted and lasted regardless of what they put it through! They used this shoe on muddy, rainy, and uneven terrain, and the shoe never showed signs of wear and tear. Even the upper stayed perfectly intact and maintained a new look for much longer than similar shoes in this class of trail running shoe. Runners were very pleased with the high level of responsiveness offered in this shoe. The shoe is very even to the ground with a 3-millimeter drop and features a midsole that absorbs shock and returns the energy to the runner. Runners liked that this shoe provided cushioning and protection, but not at the expense of feeling too disconnected to the ground below. The Action/Reaction technology used in the outsole relies on the lug system to respond to the changes in the trail and allows the foot to quickly and effectively respond to changes in terrain, direction, and speed. Runners found this shoe very supportive. The midsole features a traditional EVA foam that adapts to the shape of each runner's foot. This supports the runner and keeps the foot from moving in unwanted ways. Additionally, the upper provides a snug yet breathable fit that wraps the foot in support and helps keep it in place. This shoe was designed in Boulder, Colorado and was specifically made for intense mountain climbing, hiking, and running. Runners love that this shoe was great on groomed trails, muddy trails, and trails with loose rocks. Basically, any type of terrain that you can think of, this shoe can handle. This can be attributed to Newton’s Action/Reaction technology in the outsole. It also features aggressive multi-directional lugs that offer superior traction. This shoe is slightly higher in price than the average trail running shoe on the market today, but when you consider how many miles and the high level of durability provided by this shoe, the price is more than justified. This shoe should be viewed as an investment considered that runners commented over and over that they durability of the shoe is so high that they had to replace the BoCo AT II much less frequently than they did other shoes they had purchased before. The price is slightly higher, but so is the value, so the shoe really pays for itself. Runners were very impressed with the traction offered by this shoe. 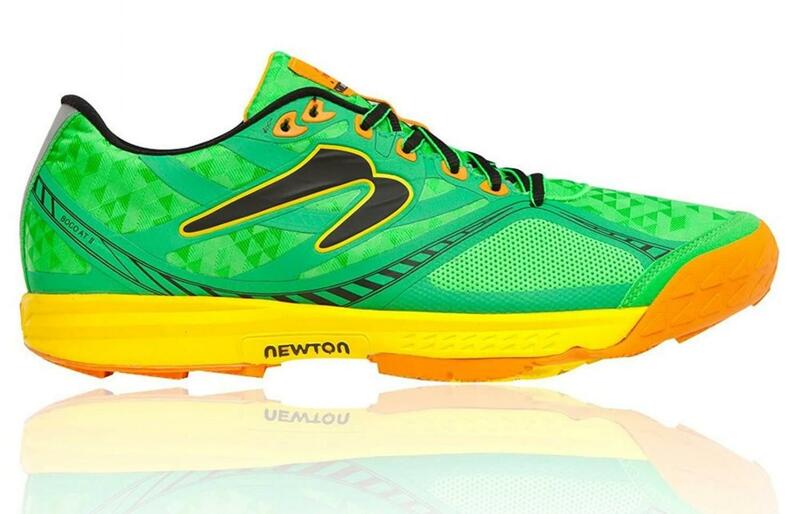 This shoe features Newton’s Action/Reaction technology along the underfoot. The aggressive multi-dimensional lug system provides superior traction to the runner and keeps them safe and secure. Runners commented that they felt confident running a variety of tricky surfaces including mud and loose dirt. Some runners commented that this shoe was much stiffer than they would have liked. The upper of the shoe features a breathable closed mesh which does a good job of moving with the foot and conforming to its shape, but the outsole and the midsole were more ridged than some runners would have liked. With that said, many runners liked the less flexible feel because they liked the support it provided. This shoe is labeled as a neutral running shoe. The outsole and the midsole work to provide the runner with added support and cushioning, but overall this is a very flat shoe that offers little in way of arch or pronation support or stability. While there are many shoes that are designed specifically for the runner with pronation issues, the Newton BoCo AT II is not one of them. This shoe features a 3-millimeter drop. Runners loved that the Newton brand of shoes is able to provide a low drop because it gives the runner a flat feel for superior responsiveness, but is also able to provide a good amount of cushioning for protection and comfort. By having almost the same height in the heel and the forefoot, the runner isn’t synthetically propelled forward and this allows the muscles in the feet and legs to properly develop with artificial handicaps.